Those two Yamaha Ydp 143 vs 163 come from Yamaha’s Arius range that is designed to provide a high-quality instrument at an affordable price and in a gorgeous traditional style cabinet for beginners. Because those models are quite similar, so we received many questions about the differences between them and whether it is a good idea to get the more expensive one. Both of Yamaha YDP 143 and YDP 163 are practical and affordable instruments, which are suitable for beginners, who are searching for the first home piano. They also help students’ progress through each grade and offer a playable instrument. ​Yamaha YDP 143 vs 163 Comparison: Which one is Better? What are The Similarities Between Yamaha YDP 143 vs 163? What are The Differences Between Yamaha YDP 143 vs 163? 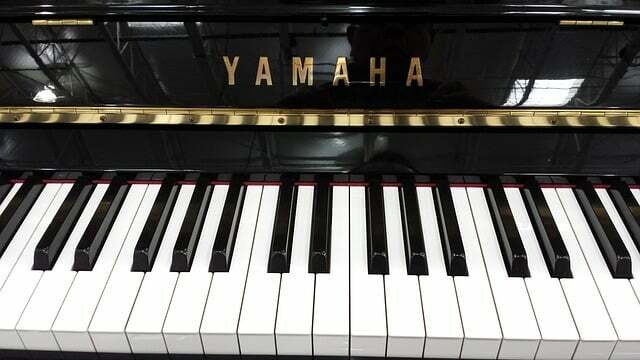 For decades, Yamaha Piano company has manufactured digital and acoustic pianos and has become one of the most popular piano brands around the world. They create a great line of keyboards, acoustic pianos, digital pianos, and hundreds of music products such as drums, synthesizers, amplifiers, clarinets, flutes, violins, guitars (I have already had two Yamaha guitars!) You just to name it, then, they will probably make it. Personally, I have owned a significant number of keyboards and pianos by Yamaha for years and still let a few of them in my studio, consisting of Yamaha guitars. My children grew up with instruments from Yamaha brand, and in my family, other musicians own and use the products from this brand, too. Therefore, when debating about instrument productions, Yamaha is the first name to think about. However, a company, which has a good reputation, doesn’t mean that they manufacture the best product, especially, in some specific range that you are looking for. It is true for almost of famous digital piano brands, thus, when shopping, you should compare one to the other to ensure that what you pay is equivalent to what you get. 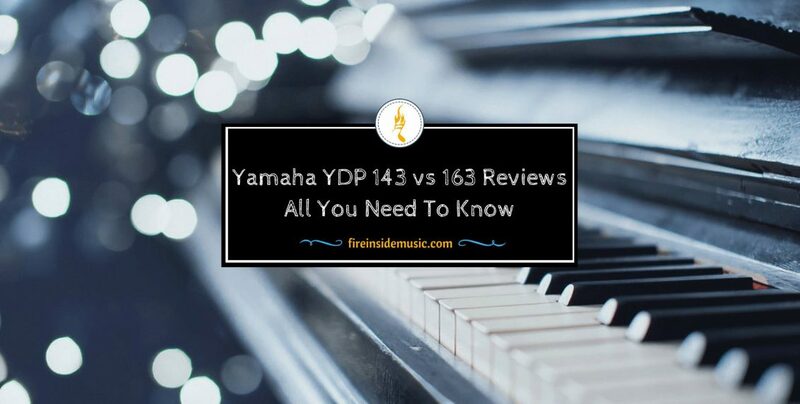 After a short intruduce about Yamaha, now we are going through a detail review and comparison between Yamaha YDP 143 and Yamaha YDP 163. YDP-143 is in the list of our top 10 best digital piano. It is a very famous piano among young stars and intermediates for good reasons, and the most highlighted one is its price. As can be seen, this piano appears as a digital piano for your home, a classical-looking piece. In spite of its size, it isn’t heavy and can be moved around the house easily. Besides, this musical instrument doesn’t need to be tuned and is electronically sampled. This means that you need not manually tune this piano and all you need to do is to plug it into the source of power and play. The total number of note polyphony that YDP 143 includes is 192. It is such an impressive ratio as it allows experienced pianists to be more colorful in the playing. On the other hand, through Yamaha YDP 143 test, this digital instrumental comes with GHS weighted key mechanism, which means that the keys can faithfully tray to imitate a real piano’s action. In addition to offering a weighted sensation, GHS also detect the strength and pace at which the keys of a piano are stricken, thus, giving distinctive samples, thanks to two inbuilt sensors. Nevertheless, GHS is still not the best mechanism of Yamaha, if you need to find a better one, then, GH3 is recommended since it can work well with 3 capable sensors to offer better samplings. Another fantastic feature that YDP-143 offers is the metronome. It increases your sense of precision and timing and can be accessed easily with a button. Moreover, this product also features the transpose function to allow for your up and down modulation by using some buttons. To conclude, thanks to GHS mechanism of Yamaha, which has been a standard for most of its D. pianos, and 192 note polyphony, YDP-143 is a considerably well-rounded digital piano. Is it worth its price? Yes, I believe that. Even though Yamaha should have added some features, songs, extra voices and implemented a better mechanism, this product is still a great digital piano. From the result of Yamaha YDP 163 test, it is easy to take note that GH3 mechanism, which classifies key action, and the including of the touch of keys with ivory feeling, make Yamaha YDP-163 much better than Yamaha YDP-143 in comparison. Yamaha YDP-163 comes with a clean CF sound-engine, which mimics the grand sound of Yamaha CFIIIS accompanied by other nine sounds. This digital piano also features extra polyphony, key sensitivity and other extra minor features in comparison with its former model – YDP-162. You will think that it may need more power to undergo all those new and promoted features, however, in contrast to what you think, it consumes a low level of energy. In addition to the USB midi function, this product introduces Bluetooth function as well. Now, it is possible for users to connect Yamaha YDP-163 to a device or an iOS computer completely wireless. This musical instrument utilizes less power than YDP-162. Nevertheless, its speakers are very powerful so that users can enjoy the stereo optimizer of Yamaha YDP-163 with the sound CFIIIS headsets from Yamaha. This digital piano also features a bench. However, honestly, the company should have offered a better one, with enough storage and seating surface for 2 players because that would have been an advantage for beginners. Yamaha YDP-163 is appropriate for both pro-pianists and novice players, at home or stage. In America, you can find this product in black walnut and rosewood. Both of the YDP-163 and YDP-143 are digital pianos with 88 keys, which share many things in common. However, there’re also some differences. Now, let’s begin with the similarities between those two musical instruments. Both of the YDP-163 and YDP-143 use an engine called Pure CF Engine to control the sounds in keyboards. They have used real Yamaha CFIIIS concert grand piano’s recordings to give these digital pianos the classic sound of Yamaha. Both of two pianos feature 192-note polyphony meaning that there isn’t any degradation in the patches’ quality. With them, pianists can even play the most complicated songs and still utilize the sustain pedal but not losing any details. Jazz organ – you can adjust the speed of the organ’s rotary speaker by pressing the pedal or the far left. Those seem to be the classic set of voices of Yamaha. You can easily find them on some other models of digital pianos from this company. The 3 acoustic piano voices are significantly impressive. They’re highly detailed with expressive and rich tones. It is easy to get lost in your piano playing and forget about the fact that you are using a digital keyboard. Though the voice’s number is limited as well as the 2 string and organ patches are not so inspiring, I would not expect or need digital pianos like those to do more than just produce a great piano patch. For those who want various, high-quality patches, it is better to look for another product since those extra voices are not particularly useful for either studio or any professional applications. These two models have the same width, which is 136 centimeters. Besides, their depth is the same – over 42 centimeters. In addition, they also feature rosewood, white or satin black finishes. On the other hand, the master volume and power button are located on the keyboard’s far right side. And on the left is the rest of other control buttons: a play button, a record button, 2 up and down selection buttons, a metronome, a voice/piano button, and a song/demo button. The power supply jack, the pedal jack, the USB terminal, and two headphones jacks are also hidden away in the piano’s underside. Besides, the option of USB connectivity is such a useful and powerful feature. Players can easily connect the piano keyboards to a personal computer or any external devices. Plus, you are also able to turn these digital pianos into a huge MIDI controller when connecting them to some software such as Garage Band and Logic Pro. Yamaha has come up with an ideal solution to deal with the difficulty of adjustment settings. You can download an application called Digital Piano Controller, in case you have an iPad. This application provides you a screen and easy ways to access to all the voices and features of your digital piano. For those who do not have an iPad, you just have to keep your manuals nearby. YDP-163 and YDP-143 are able to record your performance with two tracks. They also include 50 songs for you to play along with as well as a book to help beginning pianists and students learn. Both keyboards feature the Stereophonic Optimizer. That feature just present whenever headphones are used. It is able to pan the reverbs and the piano wider to offer users an immersive experience. Besides, it also creates some distance between the user and the piano, which helps eliminate unnatural closeness that almost of keyboards have. I think it sounds very realistic and great. Both of the YDP-163 and YDP-143 share the same 3 pedals that can be found on almost of traditional pianos: damper, sostenuto, and soft. They’re undoubtedly well-built and give users a solid feeling under their foot. I do not think that I can tell the difference between those pedals and these attached to a real grand piano. On the other hand, those digital pianos include something called the “half-damper” pedal control. Whenever the damper pedal is depressed down halfway, it just sustains half as much. The intention of this is to clean up your personal playing in case of using damper pedal, which makes it sound too muddy. Whenever you do not want the sound of the piano to be heard by the others, and all you need is to play it in privacy, then, those new models offer you a unique option with a new headphone featured, which is called Stereophonic Optimizer. The same feature is available on the Roland digital piano, and it is a cool concept as well as a welcome addition to those models. Nevertheless, without this feature, the sound is quite great through headphone with high quality, and it is true for other brands of digital piano. In addition to plugging in your headphones, you can connect a computer, a laptop or any smart devices with a MIDI/USB output by way of the USB cable. This is such a great feature, and it is also available on previous models. Nevertheless, there is not any external audio inputs or outputs, which is what I hope to see on those models. Maybe Yamaha does not think that it is essential to include these connectors to their pianos. However, I can say that I would like to see them, including the stereo audio input mini-jack, so that I can connect to external audio devices. This feature also lacks in some of those low priced digital pianos. The speaker’s power is one of the main differences between Yamaha YDP-143 and Yamaha YDP-163. While Yamaha YDP-143 includes a pair of 6W speakers, Yamaha YDP-163 has two 20W speakers. It’s essential to notice that this does not mean the YDP-163 is much louder. In fact, YDP-143 has enough gusto and amplification to fill most rooms as well as to annoy your neighbors at the same time. However, the advantage of having extra Wattage gives YDP-163 a richer bass sound and a clearer and crisper treble. Even to untrained ears, a quick comparison of the speakers between these products will give you obvious results. When you play two pianos next to the other with maximum volume, you can not only notice the difference between these two in the volume output, but you can also compare the tonal quality across all the registers. As a pianist, you can get more expression and nuance from the Yamaha YDP-163. Thanks to the Intelligent Acoustic Control or Yamaha’s IAC, both of these models sound great even though the volume is low. It means that you can still get a balanced, full sound with crisp trebles and rich bass, even when the volume slide of the piano is below the half-way. With the Yamaha YDP-143, the surfaces of the keyboard are covered in plastic, and the black keys have a matte finish. With the Yamaha YDP-163, the keyboard’s surface has an ivory feeling, which can be found immediately when comparing these two pianos side by side. On the other hand, the plastic feeling of YDP-143 keys is a little bit “clammy” and lacks in fluidity, especially when playing quick passages. On the contrary, the ivory touch adds some authenticity to the feel of YDP-163 since it intimates the surface of traditional acoustic pianos. Yamaha YDP-143 utilizes the GHS (Graded Hammer Standard) key action while the Yamaha YDP-163 utilizes something called GH3 (Graded Hammer 3). The keys of Yamaha YDP-143 are made of the plastic with a black matte finish. Generally, plastic is just a decent material. However, it is not an ideal solution for experienced players. Unluckily, the keys’ plasticity tends to scribble your fingers in tight passages. Therefore, a simple solution must be implanting the ivory keys like the ones presenting on Yamaha P-225 weighted piano. With those ivory keys, you will find that it is ultimately more delicate to touch than ever. YDP-163 comes with the new key sensor GH3, which is super acoustic-like and touchy. The keyboard of YDP-163 makes me feel a little bit more substantial when I play it, and I really like the feel of synthetic ivory key tops, which are just available on this model. In addition, the keys on this version also allow for expressive playing. Overall, the Yamaha YDP-163 offers a better feeling action in comparison with that of Yamaha YDP-143. However, both of those pianos do a great job at imitating the touch of a real grand piano. I feel that both of those pianos from Yamaha are better than other brands that I have tried. Their keys do not make me feel so plastic or fake, too. The price of those Yamaha Ydp 143 vs 163 models will significantly contribute to my option of which one I should purchase. The Yamaha YDP-143’s MSRP is not as expensive as the Yamaha YDP-163. And we have already known that the main difference between two of them is just a slightly more vigorous hammer action, so I am not sure if I would pay for the more expensive one YDP-163. The keys of YDP-163 make me feel incredible when playing while the keys of YDP-143 make me feel realistic and satisfied. It is undoubted that the keys offered by Yamaha YDP-163 are better. However, I am just not sure whether they are worth the extra $500 or not. It seems that the ideal audience of Yamaha for those digital pianos is teachers, beginners, students or some expert players, who are searching for another practice piano. For those kinds of players, I will suggest the Yamaha YDP-143. Because with this model, you can still the access to the exact similar settings, features, and sounds like the much more expensive Yamaha YDP-163. On the other hand, GHS keyboard of YDP-143 is more comfortable for players at higher levels since they are accustomed to the feel of a grand piano. Therefore, it will be a great way to get beginners and students used to the nuances and weight of a real piano with a suitable hammer action. To conclude, both of those Arius models satisfy the incredibly high standards of a musical instrument that Yamaha has set for itself. Either piano will be an ideal choice for your classroom or your home. However, I think that Yamaha Arius YDP-143 offers pianists more bang for their buck.